Introduction: Ivabradine is a novel selective If current inhibitor with anti-ischemic and antianginal activity. Objectives: To assess the effect of the selective If current inhibitor ivabradine on heart rate, angina pectoris, and functional capacity in stable patients with chronic coronary artery disease on maximally tolerated medical therapy. Materials and Methods: Consecutive patients from the out-patient cardiology clinic with stable coronary artery disease documented by coronary angiography were included. Patients had to be on maximally tolerated medical therapy with β-blockers, angiotensin-converting enzyme inhibitors or receptor blockers (ACE-I or ARB), antiplatelets, statins, nitrates, and anti-metabolics with a baseline heart rate of at least 70 beats per minute. All patients underwent assessment of angina (Canadian Cardiovascular Society Angina Class: CCS I to IV) and functional capacity (using a validated self-administered questionnaire), at baseline and after 4 months of ivabradine therapy. Results: Twenty patients were enrolled (mean age 47 ± 7 years, all male, 60% with hypertension, 30% with diabetes mellitus). Patients were on optimal medical regimen of aspirin (100%), β-blocker (100%), statins (100%), clopidogrel (90%), nitrates (35%), anti-metabolics (90%), and ACE-I or ARB (95%). At baseline, the majority of patients (90%) were in CCS class II-IV. All patients were started on ivabradine 5 mg twice daily, and in 12 patients the dose was increased to 7.5 mg twice daily. After 4 months of treatment, the heart rate was significantly reduced from an average of 82 ± 8 to 68 ± 6 bpm ( P < 0.001). 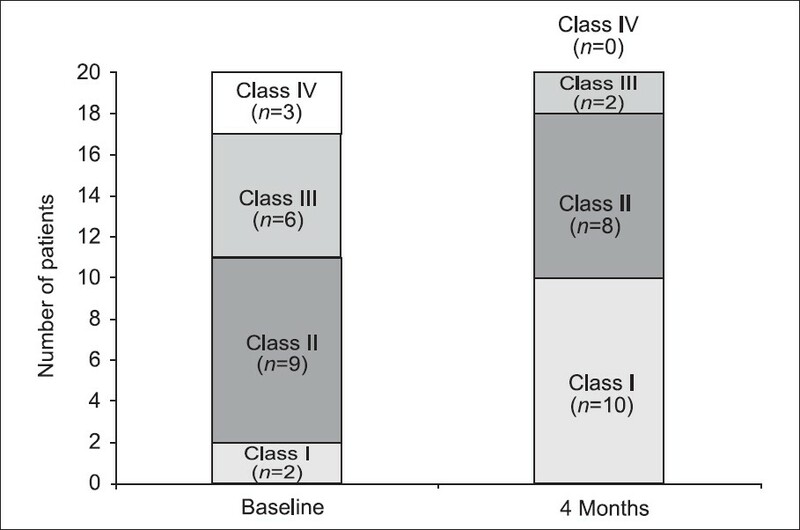 The reduction in heart rate was accompanied by a significant improvement in functional capacity (score 3.5 ± 0.9 to 4.7 ± 0.7, P < 0.001) and angina classification; at baseline 10% of the patients were in CCS class I compared to 50% after 4 months of therapy ( P = 0.01). No symptomatic bradycardia was reported with ivabradine. Conclusion: The addition of ivabradine to optimal medical therapy in patients with stable coronary artery disease is associated with significant improvement in anginal symptoms and functional capacity. Angina pectoris is typically caused by myocardial ischemia owing to an imbalance between myocardial perfusion and oxygen demand. Elevated heart rate increases myocardial oxygen demand and limits tissue perfusion, the latter by reducing the duration of diastole during which most myocardial perfusion occurs. In current clinical practice, however, many patients with stable angina pectoris require treatment with more than one anti-anginal drug, in addition to short-acting nitrates. ,,, Ivabradine is a pure heart rate-lowering agent that acts by inhibiting If, an important ionic current channel involved in the pacemaker activity in cells of the sinoatrial node. Ivabradine reduces the slope of spontaneous diastolic depolarization in these cells and lowers the heart rate at rest and during exercise. Ivabradine has demonstrated anti-ischemic and anti-anginal efficacy in randomized trials in patients with chronic stable angina pectoris when compared with placebo. It has also been shown to be non-inferior to atenolol  or amlodipine  in controlling anginal symptoms. We examined the effects of ivabradine in patients with stable ischemic heart disease on maximally tolerated medical therapy, with regard to resting heart rate, angina class, and quality of life. Proof of significant coronary heart disease by coronary arteriography. Stable treatment with maximally tolerated medical therapy. Heart rate in sinus rhythm of at least 70 beat per minute. Heart rate less than 70 beat per minute. Chronic or paroxysmal atrial fibrillation. All patients had signed a consent agreeing to join the study. The protocol of the study was approved by the ethical committee of our institution. We enrolled 20 consecutive patients with documented coronary artery disease. All were male with an average age of 47 ± 7 years. Nearly two-thirds of the patients had a history of hypertension and one-third had a history of diabetes mellitus [Table 1]. 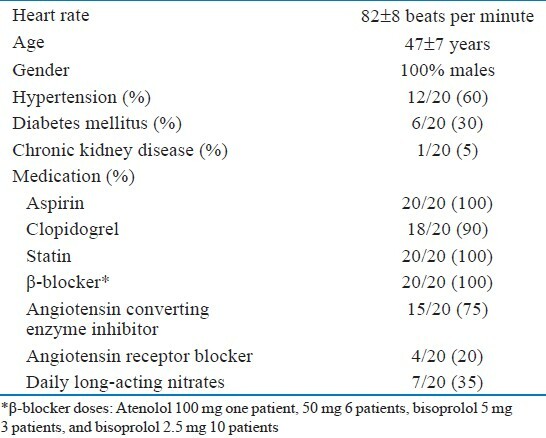 All patients were on aspirin, statin, and β-blocker, and the majority were on clopidogrel and an angiotensin-converting enzyme inhibitor/angiotensin receptor blocker [Table 1]. One-third of the patients were also on a long-acting nitrate. The resting heart rate decreased significantly from a mean of 82 ± 8 at baseline to 68 ± 6 bpm at the 4 months visit, P < 0.0001 [Table 1]. The reduction in heart rate was accompanied by improvement in angina symptoms [Figure 1]. The CCS class of chest pain [Table 2], [Figure 1] improved in 16/20 patients by one or two classes; in the four patients whose CCS class did not improve, two were class 1 and they had residual single vessel disease after PCI, and two were class II due to extensive underlying ischemic heart disease that was not amenable to revascularization. The quality of life score improved significantly from 3.46 ± 0.87 at the first visit to 4.67 ± 0.71 at 4 months visit, P < 0.0001. We prospectively studied the effects of ivabradine in 20 patients with coronary artery disease and stable angina despite maximally tolerated medical therapy followed in routine clinical practice. The addition of ivabradine to their regimen significantly lowered the resting heart rate, improved the Canadian class of chest pain in the majority of patients, and improved the quality of life score in comparison to baseline. In our study, the heart rate dropped significantly by 14 bpm in comparison to baseline which was in agreement with other authors. ,, In the study of Fox, et al. (BEAUTIFUL Trial) in the prespecified subgroup of patients with the heart rate of 70 bpm or greater, ivabradine treatment did not affect the primary composite outcome, cardiovascular death, or admission to hospital for new-onset or worsening heart failure. However, it did reduce secondary endpoints: Admission to hospital for fatal and nonfatal myocardial infarction and coronary revascularization. Our limitations in this study were the small number studied, no control group, lack of objective assessment, and the short follow-up time. The addition of ivabradine to maximally tolerated medical therapy in patients with stable coronary artery disease is associated with significant decreases in resting heart rate and improvements in angina symptoms and quality of life. Despite our study being limited, subjective assessment of patient symptoms is important. 1. Hjemdahl P, Eriksson SV, Held C, Forslund L, Näsman P, Rehnqvist N. Favourable long term prognosis in stable angina pectoris: An extended follow up of the angina prognosis study in Stockholm (APSIS). Heart 2006;92:177-82. 2. Fox K, Garcia MA, Ardessino D, Buszman P, Camici PG, Crea F, et al. Guidelines on the management of stable angina pectoris: Executive summary: The task force on the management of stable angina pectoris of the European society of cardiology. Eur Heart J 2006;27:1341-81. 3. Guth BD, Heusch G, Seitelberger R, Ross J Jr. Mechanism of benefit of beta-adrenergic blockade on exercise-induced myocardial ischaemia in conscious dogs. Circ Res 1987;60:738-46. 4. Fox K, Borer JS, Camm AJ, Danchin N, Ferrari R, Lopez Sendon JL, et al. Resting heart rate in cardiovascular disease. J Am Coll Cardiol 2007;50:823-30. 5. Daly CA, Clemens F, Lopez Sendon JL, Tavazzi L, Boersma E, Danchin N, et al. The initial management of stable angina in Europe, from the Euro Heart Survey: A description of pharmacological management and revascularization strategies initiated within the first month of presentation to a cardiologist in the Euro Heart Survey of Stable Angina. Eur Heart J 2005;26:1011-22. 6. DiFrancesco D. Funny channels in the control of cardiac rhythm and mode of action of selective blockers. Pharmacol Res 2006;53:399-406. 7. Borer JS, Fox K, Jaillon P, Lerebours G. Antianginal and antiischemic effects of ivabradine, an I (f) inhibitor, in stable angina: A randomized, double-blind, multicentre, placebo-controlled trial. Circulation 2003;107:817-23. 8. Tardif JC, Ford I, Tendera M, Bourassa MG, Fox K; INITIATIVE Investigators. Efficacy of ivabradine, a new selective I (f) inhibitor, compared with atenolol in patients with chronic stable angina. Eur Heart J 2005;26:2529-36. 9. Ruzyllo W, Tendera M, Ford I, Fox KM. Antianginal efficacy and safety of ivabradine compared with amlodipine in patients with stable effort angina pectoris: A 3-month randomised, double-blind, multicentre, noninferiority trial. Drugs 2007;67:393-405. 10. Rankin SL, Briffa TG, Morton AR, Hung J. A specific activity questionnaire to measure the functional capacity of cardiac patients. Am J Cardiol 1996;77:1220-3. 11. Campeau L. Grading of angina pectoris. Circulation 1976;54:522-3. 12. Graham I, Atar D, Borch-Johnsen K, Boysen G, Burell G, Cifkova R, et al. European guidelines on cardiovascular disease prevention in clinical practice: Executive summary. Eur Heart J 2007;28:2375-414. 13. Palatini P, Julius S. Elevated heart rate: A major risk factor for cardiovascular disease. Clin Exp Hypertens 2004;26:637-44. 14. Lopez-Bescos L, Filipova SR. Martos on behalf of the study investigators. Long-term safety and anti-anginal efficacy of the If current inhibitor ivabradine in patients with chronic stable angina. A one-year randomised, double-blind, multicentre trial. Eur Heart J 2004;25 (Suppl. ):138 [A876]. 15. Fox K, Ford I, Steg PG, Tendera M, Robertson M, Ferrari R; On behalf of the BEAUTIFUL investigators, heart rate as a prognostic risk factor in patients with coronary artery disease and left-ventricular systolic dysfunction (BEAUTIFUL): A subgroup analysis of a randomized controlled trial. Lancet 2008;372:817-21. 16. Tardif JC, Ponikowski P, Kahan T. For the ASSOCIATE study investigators. Efficacy of the I (f) current inhibitor ivabradine in patients with chronic stable angina receiving Beta-blocker therapy: A 4 month, randomized, placebo-controlled trial. Eur Heart J 2009;30:540-8. 17. Werdan K, Ebelt H. Ivabradine in combination with beta-blockers improves symptoms and quality of life in patients with stable angina: Results from the ADDITIONS-study. Eur Heart J 2011;32 (Suppl 1):340.